Ecosystem homeostasis - search for a definition. 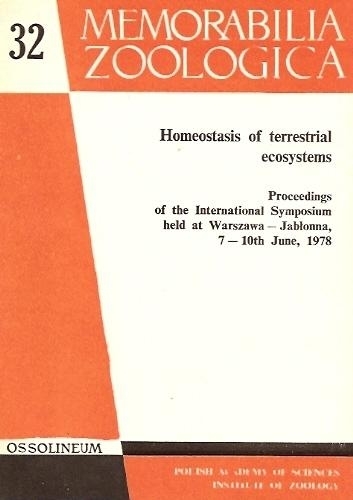 Units of homeostatic organization in terrestrial ecosystems. Mechanisms stabilizing the structure of phytocoenoses subjected to an increasing impact of man management. Interspecific competition in relation to homeostatsis in bird communities. 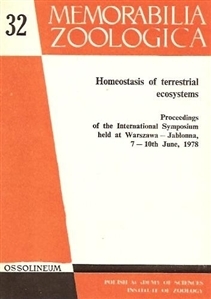 Some problems of zoocenosis restoration in degraded forest habitats. Funcioning of grassy systems in urban habitats. Number compensation between assocations of insect fauna living in lime crowns in urban areas. The effects of land reclamation on synantropic plants i the region of nitrogen plants in Puławy. The effect of sulphur industry on epigeic and soil fauna. The role of phytophages in matter cycling through ecosystems enriched with nutrients. Aspects of biomass production stabiity in a fertilized stand of Hieracio-Nardetum strictae association. The effect of marmot feeding on net photosintesis productivity of Plantago stepposaK uprian. Programme for the restoration of plant cover in the Kampinos PN.